Green clay is recognized as one of the most frequently used preparations for skin conditioning purposes. It’s completely natural, it doesn’t irritate and is suitable for treating the majority of skin types. If you’re curious how green clay works, use it to learn the beneficial action it delivers. Green clay. What is this & what are its properties? Green clay is exploited from silica-alumina deposits located in France and the USA. It’s recommended to be used for treating oily, acne and impure skin. What’s interesting, this product can be used not only externally since it can be consumed as well. Drinking green clay is used in natural medicine to treat the digestive system ailments. There are two types of green clay to distinguish: montomorillonite and illite. The first one is exploited in Southern France and it name derives from the region the clay was discovered in – Montmorillon. It contains 20 mineral salts, microelements and trace elements. The other type of green clay, illite, comes from the USA and its name originates from Illinois where the clay was first extracted from in 1937.
iron – supports collagen production and accelerates cell self-renewal processes. How does green clay work? The most popular applications of green clay include: masks (also anti-cellulite masks), peelings, bathing powders, hair pastes. An interesting use of the mineral in natural medicine is preparing a green clay drink. It helps dealing with digestive system ailments: digestive disorders, food poisoning, bowel-related diseases, inflammations of oral cavity. 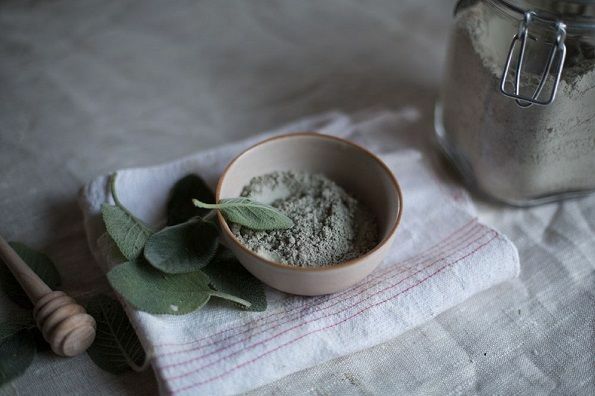 While talking about green clay consumption, before introducing the mineral to our body, it’s important to grind it down and use only wooden, glass or plastic cutlery to eat the preparation. Why is that? Simply, when it contact with steel, clay loses its healing properties. How to prepare green clay face mask? This is a very simple task. Take a clean bowl, put green clay there and add a few dashes of water. In this case, it’d better if you use either desilted or bottled water. Keep stirring until you obtain dense pulp. Then, with the aid of your fingertips or spatula apply the mask to your face, neck and cleavage. Wait 10 minutes and remember to prevent the face mask from drying out – keep spraying it either with spring water or flower water. Finally, rinse the face mask with cool water in order to close skin pores.